It's been ages since I've watched an episode of Columbo, the rumpled detective. That led me to 90 minutes on the bike while watching. I should have gone for a run. I had planned to go for a run. In the end I plumped for Columbo. My left hip was a little sore after yesterdays run and I didn't want to agrevate it so the bike it was. Now I know if I want to get back to where I once was I've really got to cut out these days of slacking but ninety minutes on the bike ain't a walk in the park - no, that would be ninety minutes walking that would be a walk in the park, if indeed the walk was in a park. By the end of the session I found myself needing some food as I was a little hypo. It might not be worth the same training effect as running but it was ninety minutes of sustained effort. The May Hill Massacre is coming up next week. Last year I said I wanted to be first local man this time around. Well that ain't going to happen but I am going to go faster than last year, irrespective of the conditions. That is a promise. Last year I was 37th in 1:07:20. The year before I was 11th in 1:03:56 and before that 13th in 1:03:43. For the record I am aiming for 1:05. After having to wait in for the van man to come and collect 'Old Crumpled' - to make room on the drive for 'Silver' - I finally got out for a run with Brown Dog mid way between one o'clock and two - commonly referred to as half past one. I tried to come up with some never tried before route... but in the end I ran through Flaxley and Blaisdon Woods. A loop here. A loop there before heading over the hill and back home. Considering how little time it snowed yesterday evening it was surprising how much snow there was on the higher bits. It moves sideways through time - although we've not yet tested that feature yet. Yes, we picked up Helen's new used van. It was all a bit of a rush but it's done now. Wasn't really up for training tonight and by 6pm I was giving it a miss. But I can't let things slip - well actually I very easily could but I don't want to. An hour later I climbed aboard the good ship exercise bike for a session. I feel a bit knackered now and the session wasn't any where near all out but it feels good to know I didn't give in to lethargy. It was a pretty pleasant run this afternoon. Not too cold. Very little wind - I'v not eaten beans for a few weeks - and dry. What more could you want? 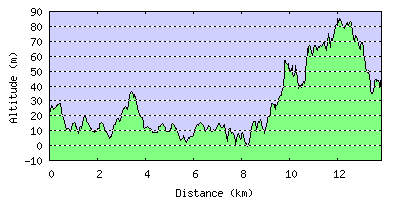 Martin and I ran the anti-clockwise Dundry route today and that meant the more difficult direction in my humble opinion, the one where you get the up all in one sweet hit with no respite. For me today was a good one - I managed to keep up with Martin! It didn't seem that we were going that quick and by the top I think we both felt OK. I was definitely running within myself - deja vu from Tuesday. and you know what? There is entirely too much 'feeling' going on in this blog post - stop it - but sod it, I'm not re-writing it! on which to race the Bridge Inn 5k. I so want to run a good 5k again but it wasn't going to be today. All day I've been under a malaise because I know I haven't done enough training. Things have been going better but it's still not there just yet. Anyway, back to the race and I almost missed the start trying to get the generator started - I sort out the lighting for the finish - but just made it down to the start in time to amble out of the blocks. I really couldn't get myself racing tonight. It was just jog, jog, jog. I guess that's a little understating the effort I put in but I honestly didn't get far outside of my comfort zone this evening. As I crossed the line and looked to my watch I was highly surprised to see I was inside twenty minutes. From my perceived effort I felt sure I was along way outside but in reality my time was 19:35 - and that really was a big surprise. I decided to give the bike a full test after its recent renovation - that and the fact I couldn't be arsed to go for a run. I'm happy to report a smooth ride - fnah, fnah. So at least I know what spares to keep in stock. And the best part of that is that those spares cost less than a tenner. Still haven't heard back from Reebok support though, which, even though I've now fixed it at low cost, is still rather annoying. A no show from Fred's Generic Gym Equipment would be poor but for a large multi-national company to ignore its user base is pitiful. On the plus side, they won't need to be bothered by me again - 'cause they ain't getting any more orders from me. When you spend three hundred notes on some gear - no, I'm not talking banned substances - the least you expect is some after sales support. It wasn't as if I was asking for a freebe. I just wanted to part with more cash to get the bike going again. Poor. Very Poor. Reebok, if you're listening, get your act together. In the scheme of things my cash might not be worth much but what little it was will be going to a competitor in the future. We ran out of Abergavenny this afternoon from the Leisure Centre and followed some of the Summer Sugarloaf route. In all we covered 12.5 miles with just a gnats nagger under 3,000 feet of ascent. We followed the Sugerloaf route all the way to the summit. From there we ran off the top along the western ridge all the way to end and then down northwards and back eastward following the reverse of the Llanbedr to Blaenavon route until the point were it heads down through the woods towards the road crossing. From there we continued easterly as we muddled our way across to pick up the southerly path that joins the northern most turning point of the winter Sugarloaf route and followed it back to the Leisure Centre - and if you've followed all that give yourself a pat on the back - because we bloody well didn't. We almost came to blows while wading through knee high bracken and undergrowth before eventually picking up the winter route - only joking. So with about five or six kilometres still to run I started to flag. Finally we arrived back at the car and headed for home. Oh, and we've bought ourselves a new van - a nice shiny second hand one - so it's not really new at all, but new to us. And it's silver coloured. We are well and truly brassic now. It was a piss poor day on the weather front and I was well up for giving it a miss. Martin didn't appear over eager but we coaxed ourselves out into the wind and the rain - have to say he had to do a bit more coaxing than me. Quick it was not as we went clockwise over the Dundry loop. On count back, I think it's the first time this year we've run Dundry and only our second lunch run - slackers are we. We were slow. It rained the whole time but at least we did it. It's been three in a row for me since Wednesday. Tomorrow Helen and I are over to Wales to check out some vans before hitting the Black Mountains - more wetness I am suspecting. I'm going to finish on a high note. The exercise bike? It's alive!!! After getting bugger all response from Reebok in the UK I'm glad I gambled on getting the bearings from the King - the Bearing-King.co.uk. It took a few minutes to get it all apart - and a few more to get it all back together afterwards - but after a bit of jiggery pokery - now, don't go looking that phrase up in the dictionary because I don't think it's politically correct - screw political correctness. Oh, and I don't think dictionaries actually do phrases so you'd be struggling on that front. There must have been about 40 Chepstovians heading out on one of three training sessions. I went with the off-road group of about ten brave - or warped - soles running the trails and tracks with nout but the illumination from a few LEDs. Helen had the best illuminatory device - but then I would say that seeing as it was a Christmas pressie from me. In all we ran about 11k, taking just over the hour - slow going - but fast enough for a night time, off-road run. Nothing quite beats the never been near a potato taste of mash from a powder - mmh mmm, yummy. After a month break from the track due to Christmas and the snow I met up with Rick and Sean for some laps. Sean ran kilometre reps while I managed 800's. Sean looked smooth while I struggled. My old pegs haven't moved quickly for that entire month away from the track - and it showed. in front of the telly, watching Starship Troopers 2 as I pedaled - what a bag of pants - the film, not the bike. My legs still feel hung over from Sunday but I worked hard on the bike. Didn't get myself up for a run, which I regret a little bit but the hours bike worked the old pegs. I'm hoping to get to the track tomorrow for the first time since two weeks before Christmas - whow, that's ages ago - I hope I can find it! And fingers crossed that if it isn't a dry evening it's just normal rain and not the other, 'colder' type of rain. I think we can all agree we've had enough of that damn stuff. The results of yesterday's race are in - and I do believe that's my best result of the year so far. Hang on, that's my only result of the year so far - doh. Technically it still is my best though. What I really mean is my best result for frickin' ages. My Blorenge was poor at under 80% - and no, I'm not going to give out quite how much below, suffice to say it was above 70% but that's as far as I'll go. Then the Cardington Cracker, where I had a good run, weighed in at 82.3%. I had a good race there, improving by a lot on my previous run there, but the percentage ain't great. Mind you, looking back at last years South Wales Hill Series I didn't get much more than 80% so that puts Cardington in a better light. And then there's yesterday's Riverbank Rollick and a whopping 87.9% - now that's the closest I've been to the magic 90% for flippin' ages. My legs ache and the soles of my feet are sore but for 87.9% I'll put up with the pain. It was a pretty good field too, looking at the times from those at the front so I think the percentage stands up to scrutiny - not like the MPs expenses - ssssh, I'm not going there - I'm in a good mood. My first run as a Chepstow Harrier is complete - but I looked more like the club tent than a runner. My borrowed vest was a little on the large size. Thornbury's Rickerbank Rollick was good clean fun - well, actually, no it wasn't, it was muddy as anything you'll encounter - although they did make us run through 20metres of stream just before the finish to clean off - how thoughtful of them. 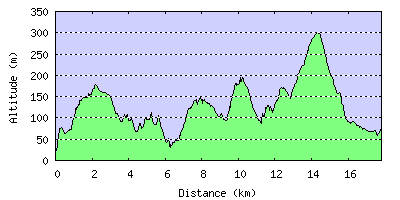 The course was pretty flat - about 400 feet of climb in total, but it was bloody knackering. Slogging through copious amounts of mud, followed by knee deep water, and then more mud was damn hard work. From the start I headed out as quickly as I dared. I overtook a few people and got overtaken in equal numbers until the stretch along the side of the River Severn. From there things settled. I stopped gaining places while continuing to lose a few. The last couple of miles was a time to hang on in there - and I was hanging, I can tell you. I paid for the faster start but I got to the finish - eventually. Overall I think I placed better by getting out there at the start but can you ever really tell? Well I don't know my finish position but I reckon I was was top 50 - and hopefully more like top 30 but I think that's ambitious as I'm pretty sure there were far more than that ahead of me. Still the results will shine out the truth like a beacon. Oh, and before I forget, well done to Thornbury Running Club and all the marshals who put on the race, without whom we wouldn't be able to do it. I've been a bit lethargic this week. In fact, training has been pants. The bearings on the bike are finally shot - bad design coupled with high use has led to catastrophic failure. I have the Reebok spares list but fortunately they list the bearing types so I shall source them elsewhere to save a few quid. I have requested the prices from Reebok but I know they'll be a mighty price compared to your common all garden 6003-2Z SKF and 6903-2Z SKF bearings. I can get all four required bearings off www.bearing-king.co.uk for under twenty quid - and I've gone for higher spec versions - don't think the prices from Reebok will come in under that. Any rate. I missed the Garth today on account of it being a one hundred and ten mile round trip for a couple of miles racing - of course the fact that it pissed down with rain for the majority of the day had absolutely nothing to do with it what so ever. I am definitely running the Riverbank Rollick tomorrow though - for one thing it's only a 70 mile round trip for 8.7 miles of racing so that's much more worth it. The snow ripped it down again overnight - 5 inches worth. Fortunately the air temperature - and the ground temperature - is up on last week and where you clear from the ground it stays clear. I took a flexi day from work, not wanting to risk travelling in such treacherous conditions. Lethargy still surrounds me though, but I have mustered for a session on the bike at high effort so it's not all doom and gloom. I really fancy a run in the snow but just can't get my arse in gear. I must admit to being a bit grumpy tonight. My T-Mobile phone is of no use at the moment. The 2G signal has been unavailable since New Year's Eve and I've never been able to get 3G here. All very annoying. They say they are working on it but that ain't getting it fixed is it? Words is just words. I want actions. I don't want to be carrying around an expensive brick. My guess is that they don't have many customers off the transmitter and they can't be arsed to fix it. I'm giving them another week as I'm feeling kind - and because other than this blip, I've been happy with things. But if it ain't working by the end of next week then Mr Direct Debit is going to mysteriously become absent without leave - I ain't paying good money for no service - they can go whistle until it's fixed. On top of that the bike is playing up - and this time there's no permanent fix. It's a Reebok bike and cost good money but by design it is poor. The main bearing on the fly wheel is sideloaded from the drive belt. It's not balanced so there is quite a twist force - too much in fact and the bearing is on the way out. I've given it a clean and some lubrication but almost no way to reduce the twisting force so it's only going to get worse until the day it seizes up completely - and I don't think that day is far off. Next up my re-chargeable workman's lamp started to flicker. A shake here, a shake there got it going but it didn't last long. Then it worked no more. So I stripped it apart - it's all plastic these days and not built to be de-constructed once it's been put together. Suffice to say it isn't quite so waterproof any more. But after a bit of soldering it does at least work - even during the vigorous shake test. This time I was joined by Helen and Brown Dog. With slightly weary legs I struggled. We ran basically the same route as I solo'ed yesterday but with a few different variations - the riddle-me-re variations this time. It made the run half a mile shorter with a couple hundred feet less ascent but still over 2,000 and just over ten and a half miles. The snow made for good running today. It didn't seem as slippy - but then again I wore my fell studs today and got better traction on the uphill sections. It was also much colder today. Yesterday's blue sky was replaced by cloud. On May Hill it was almost a white out with the visibility down to under a hundred feet. Well I didn't have any but I sure as heck needed a pair - it was snow-rific out there but I think I've seen enough of it now. Having spent the week away from home on the grounds of making sure I could get to work I really don't want to spend another week in a similar fashion. Please let Michael Fish get it wrong - again - and the forecast of more snow on Sunday be total bobbins. Fingers crossed. Anyway I managed just over eleven miles with 2,500 feet of ascent but it was slooooooow going. It wasn't too bad along the flat - although I was slipping around a little. The descent was fine. In fact, it was bloody good fun. Piling down into the unknown. Would your foot strike something solid? Or would it be deeper than expected causing a stumble - I kept my feet. If the coming down was fun the going up certainly wasn't. 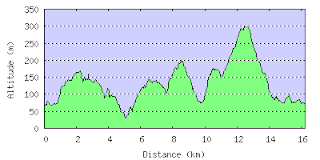 I ran the Longhope Three Peaks with the enigma variations to mix it up a little. That meant there was a fair bit of up. Going up was just non-stop slip after slip after slip - I should add that it wasn't the kind of slip on your arse slip, more the two feet forward one foot back type. Although only eleven miles it felt like fifteen by the time I arrived home. Well I'm off to rest up now because I'm knackered. Oh yeah, and here are some photos and the route. The snow pretty much forced it on me - at gun point (except there was no gun involved). I decided that I should rest the car in light of the snowy conditions and use my own two feet instead. The roads didn't actually look too bad. The gritters had obviously been out early - or late the night before - and done their job. It was a pretty relaxing run though - apart from the discomfort of my rucksack which, unlike my Mizuno one, wasn't designed for running. I'd promised a run with Martin at lunch so run number two came at high noon. We even persuaded Clive T to come out to play. There was no up and over Dundry though. We stuck to a flatish route. It went well apart from some yobs who decided it was funny to throw snow balls at us. I caught a soft one on the back and another, thrown with more venom, to the side of the head. The little F#$&wits - lock 'em all up and through away the god-damn key. Finally home-time and run number three - the voyage home. The pavement was still runnable and it was another pleasant run. Pleasant that is until more yobs, this time driving a car - a scary prospect because they clearly had the IQs of retarded, malformed baboons - swerved towards the side of the road, clearly on purpose, to flick up the slush at me. Now I didn't lower myself to their level or rise to the bait. I ignored them to lessen their enjoyment. I just kept running. Thicko's like that don't know any better - thick is, as thick does. I was more than a little pissed off, soaked and it was freezing on me. Luckily I only had another few minutes left to run. Oh well, maybe, just maybe they'll try something like that again, lose it and total their cheap, all they can afford, old banger - damn, I've just lowered myself to their level - f#$& it. Despite the bad, the good won out and it's been a solid days running. Out and about for another run, the Longhope 3 Peaks - which actually takes in five hills but we only count three and I managed to run them all. I was, however, not quite so strong as the other day - Helen was pulling ahead - or had she improved? Whatever. During the run my legs felt tired - even after a days rest. That didn't please me but the 10 miles and 2,000 feet of ascent gave me a slightly warmer glow. I'd like to think I'll be hopping on the bike later but the chances of that are slim - and should I rest up anyway, on account of the legs feeling tired? but only just! We pootled through Flaxley Wood and no more. No Hang Over 10k. No Gloucester 5 Miler either. Just an easy 11k with 1,000 feet of ascent. It was a lovely day for it though - stop it. Crisp, frozen earth and bright sunshine glistening through the tree tops. After the run we headed into Gloucester to meet up with Sian and Phil for lunch in the Pilot Inn and to catch the race result. Phil ran, Sian did not on account of coming back from injury and, in fact, Phil won it - nice work. His prize? Choccy biscuits - nicer - but I'm not sure that's the best of winnings for a lean, mean running machine such that he is. Well that's it for today 'cept maybe I'll hope aboard the bike later for a top up - you know it makes sense.